Lloyds Bank celebrates its time with its customers in a new advert, featuring “The Running of the Horses”. The spot opens with a young girl waking up before the crack of dawn and getting dressed, with the help of her mother, to leave the house. A warm sweater and a pair of black rubber boots, paired with a lantern to light her path, are some of the “ingredients” for a recipe that it turns out it includes many other locals of the town she’s living in. They are all heading to the beach, to see a herd of wild horses galloping. The animals stop to greet the people, who are of all ages and backgrounds. 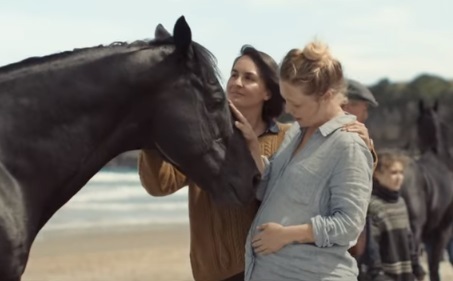 The girl, who is overwhelmed by emotion, a pregnant woman, and a young man with Down syndrome are seen caressing the head of black horses, before the end of the film, which features the bank’s tagline, “By your side”, flashing across the screen. The soundtrack is a cover version of the 1996 song “You’re Not Alone” originally by Olive, performed by Jennifer Ann (Astraea), the British singer/songwriter who also performed the famous “Mad World” cover for a previous Lloyds advert. Jennifer’s version of “You’re Not Alone” was released as a single on March 23 and is available for purchase for £0.99. The black horse is the recognized emblem of Lloyds, whose adverts are notable for showcasing real horses. From the late 1980s, the bank’s advertising campaign featured the Trakehner stallion Downlands Cancara, until he died, in 2006. Three new horses – Dante, Tarantino and Imperator – succeeded him until 2012, when a new stallion, a 17-year-old Trakehner from Holme Grove Farm, Beds, was chosen as the black horse for Lloyds TSB’s advertising campaign for the next three years.